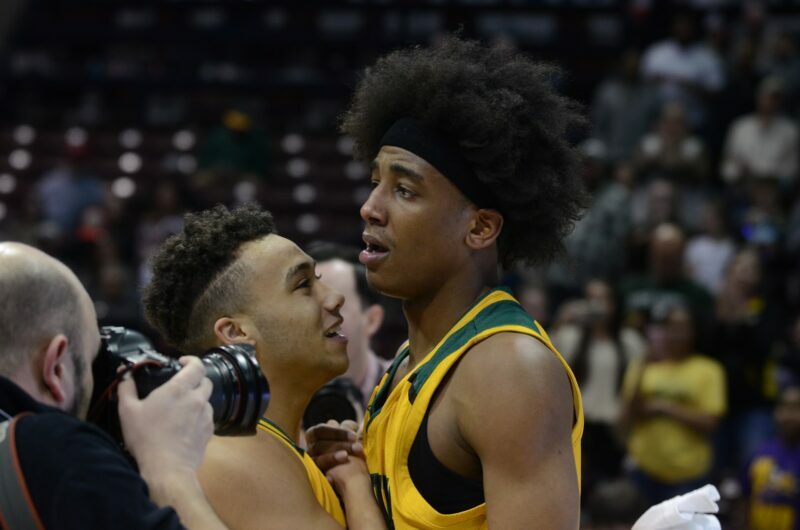 The Bruins made history Saturday, March 16 by winning the first boys’ basketball state championship. Defeating Christian Brothers College (CBC) High School, the Bruins won the Class 5 Missouri State High School Activities Association state championship game (63-59). With five minutes and 42 seconds left in the game, the Bruin tied the Cadets (47-47), which Scanlon notes as a reason for the team’s added momentum, emotion and energy. Senior Dajuan Harris is one of six seniors on the team. Tonight’s game, he said, is years of emotion coming out for this year’s senior class. Last season, the Bruins fell in the semifinal game of the state tournament. Senior Noah Patrick said the experience of the previous year only made the team more hungry. Heading into the fourth quarter in hopes of gaining a new rhythm, Harris said it was all about trying to attack and bring the team back in the game. Scanlon, speaking about Harris, simply said he makes things happen for the team. Following the game, Scanlon was seen immediately going to his family. Having his entire family present, from his children to his brother, was great, Scanlon said. Did you watch the game in person? Let us know in the comments below! That’s so great that they finally got to win the state championship. I’m happy for them!